AUSTRALIAN opener David Warner has taken great joy in terrorising India's bowlers, while baiting them with some verbal barbs all summer. But he also showed a deeply compassionate side on day one of the fourth Test at the SCG. Warner was at his brutal best, scoring 101 from just 114 deliveries against the demoralised Indians on a belter of a Sydney deck. He helped the hosts get off to a flying start, reaching 2-348 at stumps with an unassailable 2-0 series lead in the last of the Border-Gavaskar clashes for 2014-15. But while Warner frustrated the tourists once again with his third destructive ton of this series, on 63 not out, he needed a moment to pause and re-compose himself. That number has become such an important milestone for all Australian players this summer, following the tragic passing of Phillip Hughes in November last year. 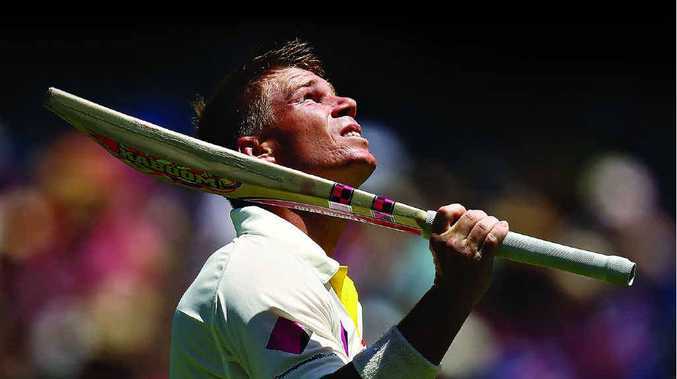 A tearful Warner looked up to the heavens to remember his great mate, before crouching down and kissing the retired pitch where Hughes fell while unbeaten on that number playing for South Australia. Warner spoke about how hard it would be to focus while batting in this Test - the first at the ground since Hughes was fatally hit by a bouncer. And while his footwork was not at its crisp best to begin his innings, it didn't take long for the diminutive, but powerful man to get going. He went on to hit 16 fours in what has been an unbelievable series against the tourists, now boasting 423 runs from seven innings at an average of 60.43. Fellow opener Chris Rogers also had a day out, making 95 as the two combined for a 200-run partnership. While it was Rogers' fifth consecutive half-century, he was left bitterly disappointed with his dismissal. He chopped a Mohammad Shami delivery on to his stumps while tentatively pushing at the ball. But the ball before, he smashed a similar delivery for four through the covers. He did, however, receive a huge reprieve on 19, put down after gifting a straight-forward chance to Lokesh Rahul at second slip. Rogers was dismissed just four runs after Warner, who got a leading edge off Ravi Ashwin and spooned a catch to Murali Vijay. And while the out-of-form Shane Watson started slowly, he was unbeaten on 61 by the end of the day as the Indian team took its foot off the pedal. Like Rogers, Watson also received a huge chance and it came in the last over of the day, Ashwin letting a ball slip through his fingers in the slips off the bowling of Umesh Yadav. Stand-in captain Steve Smith was at his fluent best once again, not out on 82. Like Warner, Smith has enjoyed a fine summer, with 663 runs to his name so far this series, raising his Test average to 52.3 in the process.